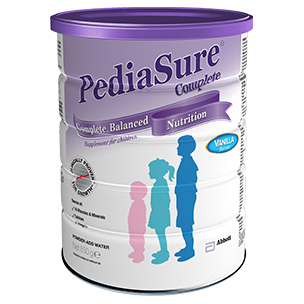 PediaSure® Complete gives your child all the nutrients they need so you can watch them grow up healthy and strong. Contains 16 vitamins and minerals. Provides essential Omega 3 and 6 fatty acids. Favourable oil blend: easily absorbed and well-tolerated even in those with impaired fat digestion. Iron: supports rapid growth and promotes catch-up growth. CONTAINS ALL THE VITAL MACRONUTRIENTS IN CORRECT PROPORTIONS. PROVIDES ADEQUATE CARBOHYDRATES AND CALORIES FOR ENERGY AND HEALTHY WEIGHT GAIN. Delicious flavours – liked by 97% of children5. *Caution: Not suitable for children with galactosaemia. Add 5 level scoops to 190 ml cold water. Mix well. PediaSure® Complete Vanilla and Chocolate 400 g / 850 g tins. Alarcon PA, Lin LH, Noche M Jr., et al. Effect of oral supplementation on catch-up growth in picky eaters. Clinical Pediatrics 2003;42:209-217. Krause’s Food, Nutrition and Diet Therapy – 10th Edition. L. Kathleen Mahan, Sylvia Escott-Stump p47. Akram DS, Bharmal FY, Hussain T. PediaSure in the treatment of severe malnutrition in Pakistani children JPMA 2000;50: 377-380.